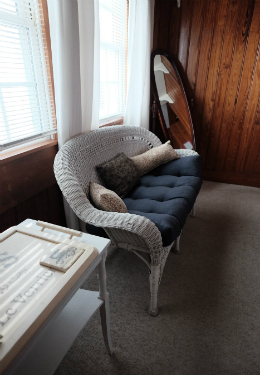 If you are looking to stretch out a bit, the Romance Suite is for you. The room is comprised of a bedroom and a separate living room joined by a spacious bathroom. Relax in a queen-size bed or catch up on favorite episodes with a 32 inch Smart Roku TV while lounging in fluffy bathrobes. 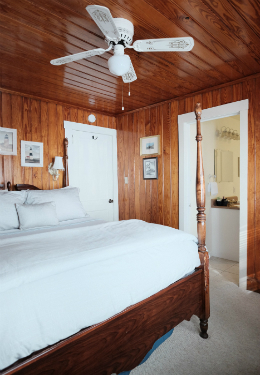 Located on the second level of the inn midway through the house and close to the back deck, the suite is ideal for beach vacations, longer stays, Girlfriend Getaways, and of course… romance. Rooms are cooled and heated by individually controlled mini splits and are approximately 12’X10’ in size respectively. When booking, don’t forget to add a Romance Package or schedule a spa treatment in our dedicated massage therapy room located right next door. This room has a two-adult maximum occupancy.